WASHINGTON - June 2, 2018 - PRLog -- President Trump's lawyers, in a previously confidential letter to Robert Mueller, told the Special Counsel that Trump could legally terminate his entire investigation, or stymie it by granting pardons to witnesses who otherwise might be forced to testify, or even pardon himself. Although the applicable law is far from clear, it looks like these expensive claims may be true, and that the only remedy for any misconduct once he has taken office is through impeachment, says public interest law professor John Banzhaf and several other law professors. Indeed, some commentators have suggested that Trump's earlier decisions to pardon Lewis "Scooter" Libby and Sheriff Joe Arpaio, his more recent decision to pardon Dinesh D'Souza, and his statement that he might pardon Martha Stewart and Rod Blagojevich,were meant to signal to those being pressured to "flip" that he is likely to remove the prosecutor's threats by being willing to issue pardons to them. In this way a major investigative technique - offering amnesty, or at least special consideration, to suspects who agree to be flipped - will be taken from Mueller. This concept was probably also behind the offer of presidential pardons which were reportedly made to the Watergate burglars. But it could be far worse than that, suggests Banzhaf, because the President could virtually shut down Mueller's entire operation by relying on clear precedent to issue a mass blanket pardon to all of those who may have been involved, and/or are being investigated, without even naming them individually or identifying the specific crimes. 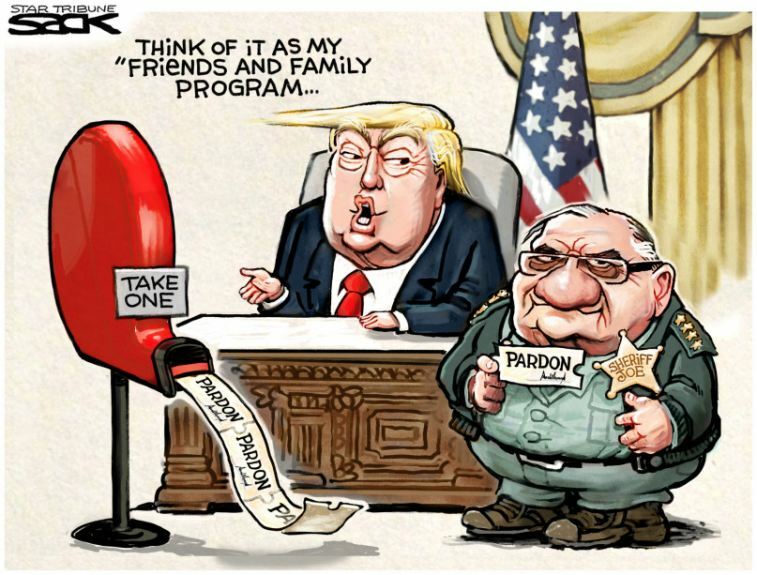 Moreover, if it became necessary, it might even be possible for President Trump to pardon himself, although that might precipitate a major constitutional crisis, warns Banzhaf. Both options were reportedly actually discussed by Trump and his legal team. A recent precedent is the pardon which President Gerald Ford issued to former president Richard M. Nixon in September of 1974. It said: "I do grant a full, free, and absolute pardon unto Richard Nixon for all offenses against the United States which he, Richard Nixon, has committed or may have committed or taken part in . . ."
So it seems clear that a full and absolute pardon can be issued, even without naming any of the crimes which might have been committed, or waiting until formal charges are brought or even sought. As the Supreme Court has said, the pardon power "may be exercised at any time after its commission, either before legal proceedings are taken, or during their pendency, or after conviction and judgment." Moreover, earlier precedent shows that such full and absolute pardons may be issued to a very large and even unspecified group of people. For example, President Andrew Johnson issued a single comprehensive and blanket pardon to all those Confederates who "participated in the existing rebellion"; a pardon which was valid once they took an oath of allegiance to the U.S. government. This pardon was later extended to all who had taken part in the unlawful rebellion, including some who has been excluded from the original pardon. Then, in 1893, President Benjamin Harrison issued a mass pardon to all members of the Church of the Latter Day Saints who had committed polygamy. In still another blanket mass pardon, President Jimmy Carter pardoned all Americans who avoided the military draft so as not to have to serve in the Vietnam war, including those who fled from the U.S., and those who failed to register as required. In addition to issuing an open ended blanket pardon for all those who might be charged in Mueller's current investigation, and/or any federal charges growing out of the events being investigated, an alternative might be for the President to simply pardon himself. Judge Richard Posner of the Chicago-based 7th U.S. Circuit Court of Appeals asserted that a self-pardon would be constitutional. He wrote: "it has generally been inferred from the breadth of the constitutional language that the president can indeed pardon himself." Judge Posner added that it was unlikely the Supreme Court at that time would be "bold enough, in the teeth of the constitutional language, to read into the pardon clause an exception for self-pardoning." Professor Banzhaf agreed, and added an additional important legal issue; that even if such a self pardon were unconstitutional, the issue might never be ruled upon by a court because of procedural problems such as finding any person or entity with sufficient legal standing to initiate a court challenge. As the American Bar Association Journal reported: "If [Hillary] Clinton were indicted and became president, she probably could pardon herself, according to Banzhaf. And if she did that, and someone wanted to challenge the pardon, it is doubtful any potential plaintiff would have standing to sue, he says." Of course, any of these actions might have major political repercussions for Trump. But, as Politico noted: "a self-pardon would be . . . just the kind of departure from prior norms that typifies Trump." Moreover, with majorities in both houses, Trump might be willing to risk impeachment, and any political firestorm, especially if he believed it was necessary to protect himself, suggests Banzhaf. In summary, Trump has many perfectly legal ways to thwart Mueller's ongoing investigation of the President, and of his family and associates, anytime he wishes. One, widely discussed, would be to order Mueller's dismissal as Special Counsel by appropriate Justice Department officials, perhaps in an updated version of Nixon's Saturday Night Massacre.